There are many simple things that the average Las Sorres area resident can do to raise their Dental IQ and improve their oral health. One simple lesson involves bacteria, and everyone’s mouth has a lot of it. But, don’t worry, bacteria per se isn’t the problem. 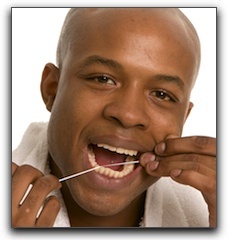 Dental problems occur for Rancho Santa Margarita patients when the balance of bacteria becomes unhealthy. This is where brushing and flushing come into play. Another precaution you can take to guard against the wrong kind of bacteria is to keep your toothbrush as far away from the toilet as possible, and close the lid of the toilet before you flush. If you can avoid decay, it’s less likely that you will need more extensive dental work such as dental implants and crowns. I’m Dr. Lincoln Parker and I am passionate about helping my patients have healthy teeth and beautiful smiles. If you would like to know more about a custom smile makeover in the Rancho Santa Margarita area, give us a call at 949-429-0049 and a member of our friendly staff will answer any questions you have and schedule a consultation at your convenience.